"The whole event on the Golden Jubilee was excellent!" 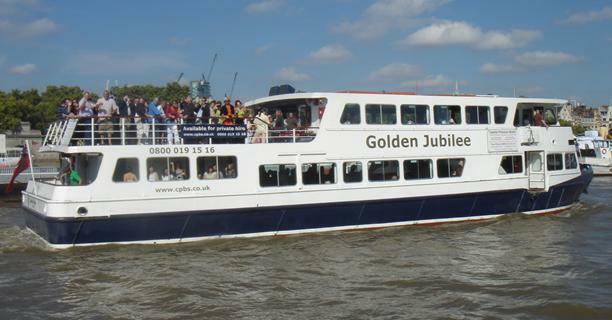 "Thank you and the team for a great night on board the Golden Jubilee"
"CPBS are fantastic boats for an amazing party. We would definitely recommend the hire of one of the boats to our friends." "It was a superb evening, really well organised, lovely boat, lovely crew and service throughout." 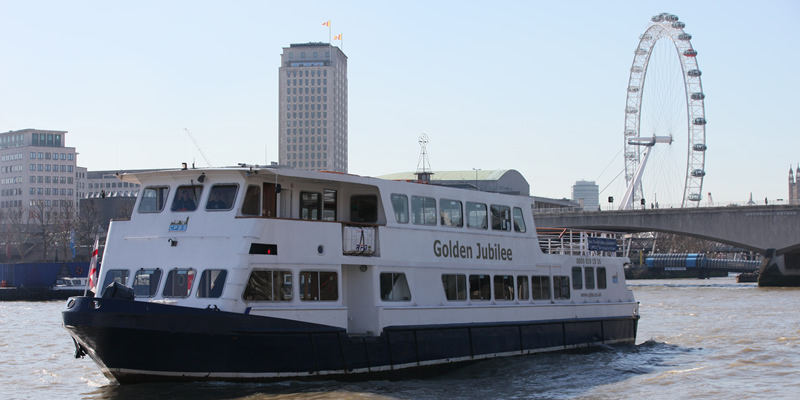 The Golden Jubilee party boat has proven herself time and again to be one of the best London party venues on the River Thames. 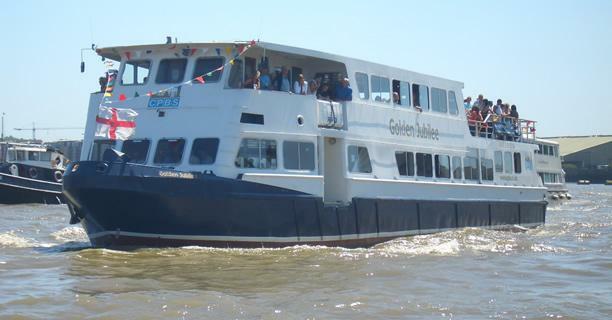 With two spacious internal decks, a bar on each level, and an extensive sundeck, the Golden Jubilee is extremely flexible and suitable for all types of function for up to 240 guests. Why not have a look round with our fully interactive 360° tour, or alternatively contact us now to discuss your party idea and put your preferred date on hold for free. The most common comment we receive about the Golden Jubilee is just how much space there appears to be. Her 2 spacious decks can hold 240 passengers with ease and still leave room for a band or casino tables. The lower deck contains a solid wood dance floor with lots of bench seating around the front and down the sides of the deck, leaving ample room in the centre for 3 rows of tables, if required. The bespoke bar was created by our in-house design team and is fully stocked with a selection of draught and bottled beer, a full range of branded spirits, soft drinks, wines and champagne. Should you require catering a full service galley is also on this deck, hidden out of sight of your guests, behind the bar area. 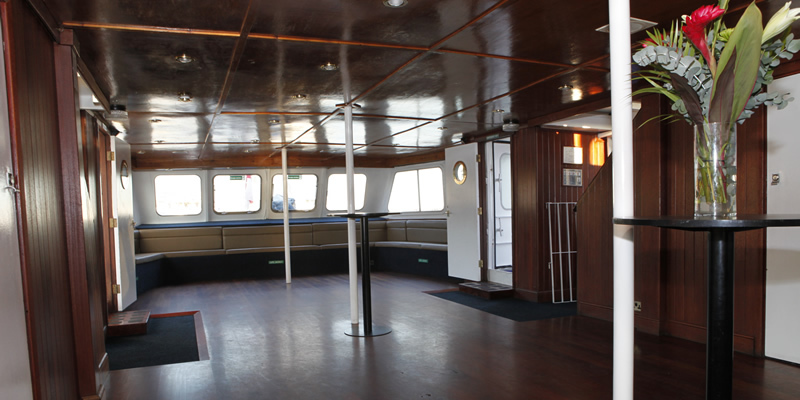 On the spacious upper deck you will find a second bar, further seating and another solid wood dance floor. There is a bespoke, enclosed DJ booth and plenty of space for a live band or other entertainment if you wish. On warm summer day or evening functions the double doors will remain open, allowing guests to take full advantage of Golden Jubilee's magnificent sundeck - large enough to hold 150 guests with ease. 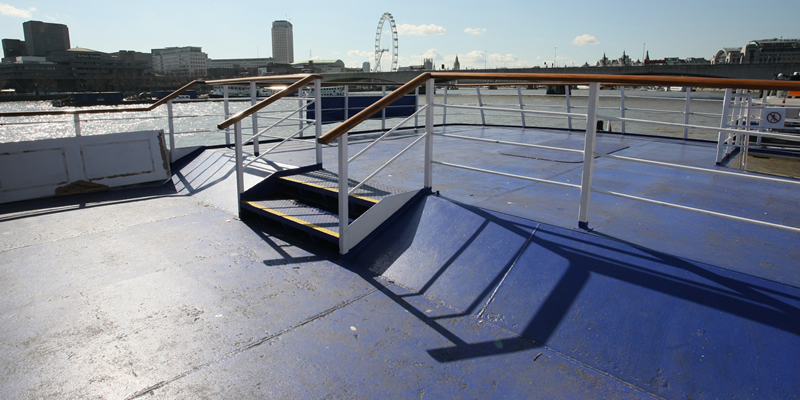 What better way to enjoy the summer and views as we cruise past many of the best known landmarks in London? Golden Jubilee is able to accommodate up to 240 guests. Minimum numbers may apply during busy months, please call the office for more details. DJ's, live entertainment and catering can be arranged on request. Special rate applies for New Years Eve.